Most people probably know Portland, Oregon, is a city of bridges. We have ten in all. Once a year all the bridges are closed to car traffic for awhile so bicyclists can ride across them. Providence Hospital sponsors the event. 20,000 people signed up to ride this year! Entrants can choose routes that let them ride 10, 8, or 6 bridges. 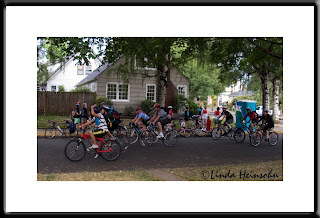 The 10 bridge route takes the cyclists through Westmoreland right past our house! Here is one of the most crowded photos I was able to get near the end of the ride. Just a few of the 7,000 people who chose this longest route of the day! And yes, that IS a porta toilet parked on the corner across from our house.